Designed to protect floors from scratching, scoffing or other damage that is typically caused by bulky fitness equipment, these DKN floor guards are supplied in a pack of six and fit together like a jigsaw. In addition to the six pieces of actual flooring, each pack contains enough edging material to ensure straight lines around the outside of the assembled matting. This flooring is manufactured from hard wearing, lightweight rubber and is 12mm thick, assisting with sound absorbtion when used to protect floors from high impact fitness machines such as treadmills. 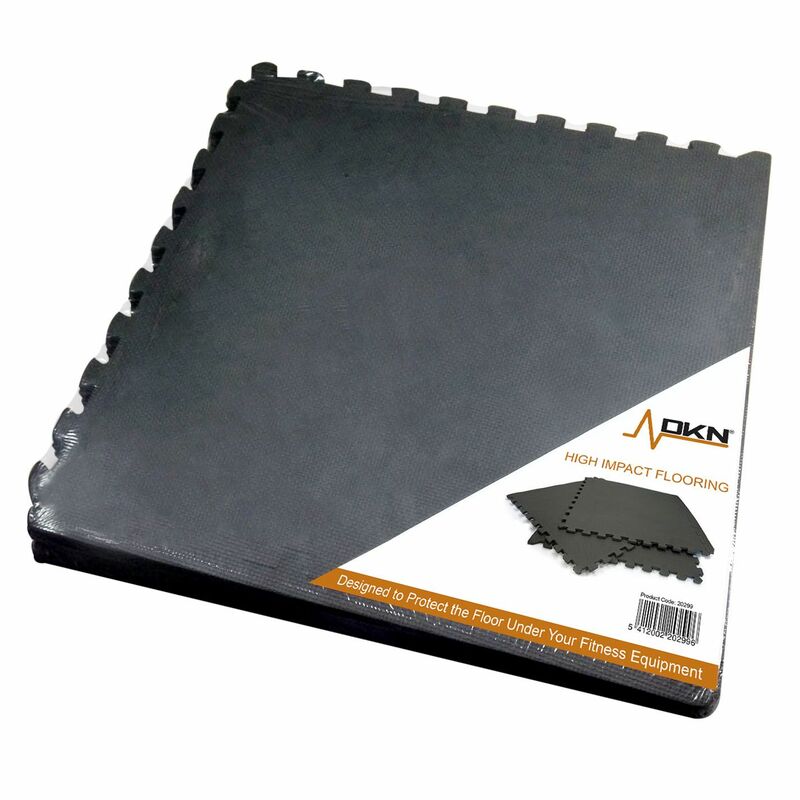 for submitting product information about DKN 6 Piece High Impact Interlocking Floor Protection Mat We aim to answer all questions within 2-3 days. for submitting product information about DKN 6 Piece High Impact Interlocking Floor Protection Mat. We aim to answer all questions within 2-3 days. If you provided your name and email address, we will email you as soon as the answer is published. The pieces of this mat fit together well and end pieces come with the pack which tidies up the edges. The thickness of the tiles is such that it works well to protect the floor, minimise noise and provide a surface that can be wiped over. A great product. Good looking and easy to put together, but the foam is easily dented when anything with an edge is placed on it, in my case, the wife with the clothes airer!!! It does bounce back to some degree but not totally.Also, with it being foam, the locking 'arms' do come loose and the mats move, but no major problem. Came already as a huge 6 piece jigsaw, which actually made it fun to put together (sad, I know). Perfect size for the bike. Makes your room smell like a gym, which is a good thing. Quality product! As my cross trainer has not yet been assembled I have not yet used the entire Protection Mat. However I am very pleased with the quality of the portion of Mat I have put to use. I got this as a free gift so it was extremely good value, however now I have used it I would strongly recommend it and would buy it myself. The mats do not cover the area that the multigym covers so the legs overhang. Not really fit for purpose. Really good size when pieces fitted together. So deep,and cushioned, makes exercising on my upright bike a pleasure. Does what it is meant to do! Fits together easily, is fairly thick, protects the floor and reduced noice. perfect for my new exercise bike. Protects the floor under the multi gym, purchased when I got multi gym was a good investment. Easy to put together and saves wear and tear on the carpet. An absolute must if you have a heavy piece of kit. This item came free with delivery of some gym equipment. The matting is very simple to put together and locks securely and is of good quality. I am very happy to have this matting as it protects the flooring underneath and provides a stable surface for the gym equipment. Even if you can't find it for free, I would recommend buying it - you should not be disappointed. 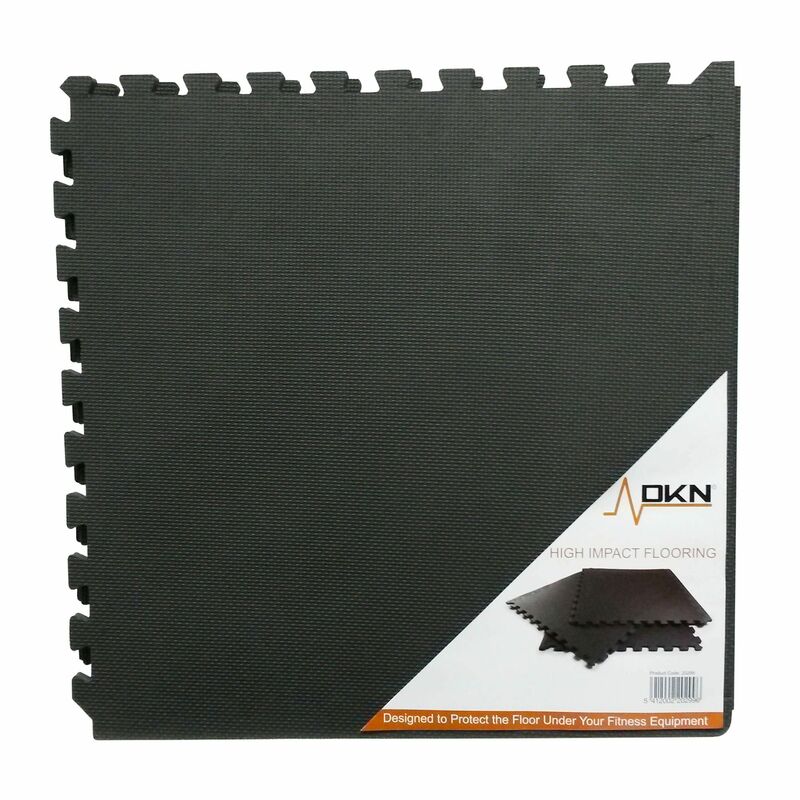 for submitting product review about DKN 6 Piece High Impact Interlocking Floor Protection Mat.